Anyone who’s visited a bar or spirits retailer over the last few years will be aware of the gin bloom. Last year saw record UK sales of more than 40m bottles, with 2016 being dubbed ‘the year of gin’. This meteoric rise is far from over (with more than 40 new distilleries opened in the UK last year alone), and with an increasingly dynamic and diverse range of quality-led gins on offer – who’s to complain? 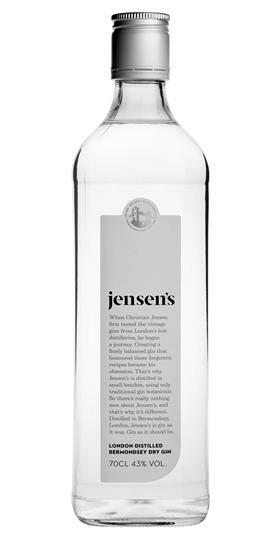 Jensen’s Bermondsey London Dry Gin | £26 After tasting vintage gin from a long-lost London distillery, Christian Jensen set out to create an uber-traditional London Dry using only botanicals available in the 1800’s (no cucumber or seaweed here). Made at a small distillery located in railway arches near London Bridge, this is a gloriously traditional juniper-led gin with a strong pine note from the Italian juniper berries, and a touch of violets, spice and herbs. Rich and complex yet subtle and smooth. Delicious in a dry Martini, or a classic G&T with premium Indian tonic water and lemon or lime. Martin Miller’s Gin | £25 was a trailblazer for the gin renaissance, launched in 1999 at a time when gin was a business few in their right mind would go into. It was made with martin’s uncompromising vision to create the perfect gin. The lighter botanicals are distilled separately to the earthier ones, then blended together for balance, along with distilled cucumber. The resulting strong spirit is then sent on a 3000-mile round-trip to Iceland, where it is ‘cut’ to bottling strength of 40% abv with the purest water source available; mountain-filtered glacial melt water. Why shipped to Iceland? Back in the 90’s import laws meant water had to be ‘demineralised’ to transport across the EU (negating the whole point of using it). Does the effort make a difference? Yes. Awesomely fresh, pure, crisp and balanced. This is my go-to end of a long day gin served neat over ice. Also great in a Martini or G&T. Try it with Dr Polidori’s Cucumber Tonic or with Fever-Tree Elderflower Tonic as a relaxing spring/summer sipper. Brilliantly berry-infused Brockman’s Gin | £32, uses ten botanicals including blueberries and blackberries. Flavoursome and fruity, but beautifully balanced, I love to sip this neat. Warner Edwards Victoria’s Rhubarb Gin | £35.50 is cleverly made using the pressed pink juice of a rhubarb crop originally grown in Queen Victoria’s garden. Fully flavoured, tangy and a little sweet, but again a beautifully balanced gin that’s a huge treat on its own served over ice or in a G&T.